In 1976 engineers at McDonnell Douglas Helicopter Company (then Hughes) decided to explore the theories of Henri Marie Coanda (1885-1972), a Romanian-born aeronautical engineer and inventor, who put forward the concept that air flowing over a curved surface tends to follow the curve of that surface. The “Coanda Effect” is seen working when air flows over the surface of an airfoil. Under this effect, the aerody-namics of the tailboom itself could be tapped to provide the bulk of the anti-torque force required. It is this principle which is at the heart of the NOTAR system embodied in the MD520N. The front half of the helicop-ter is virtually identical to the MD 500E, but in place of a conventional tailboom and tail rotor mechanism, the MD 520N has a variable pitch fan totally enclosed within the tailboom, circulation control slots on the side of the boom, and vertical stabilizers and direct jet thruster. The variable pitch fan is driven off the back of the Allison 250-C20R turboshaft engine and, with help from the main rotor system down-wash, draws air via a grill into the enclosed tailboom, and provides low-pressure, high-mass airflow. Air is forced out through the circulation slots on the right side of the boom. Air exits the slots at about four times the velocity of the rotor downwash, which keeps the downwash attached to the curvature of the boom, resulting in the horizontal equivalent of lift, just like a vertical wing, and the Coanda Effect generates anti-torque force. The direct jet thruster is located at the end of tailboom on the left side, and provides directional control plus assists with anti-torque. Even the engine exhaust stack helps out here, as it is canted to the left. However the bulk of the anti-torque required (eg 60-70 percent in hover) is provided by the Coanda Effect. Directional control above in forward flight above about 20 knots comes largely from the left vertical stabilizer, which is linked to pilot’s pedals. The effectiveness of this system is such that the MD 520N is approved for hovering in 30 knot crosswinds, and has been flown sideways at speeds signifi-cantly higher. 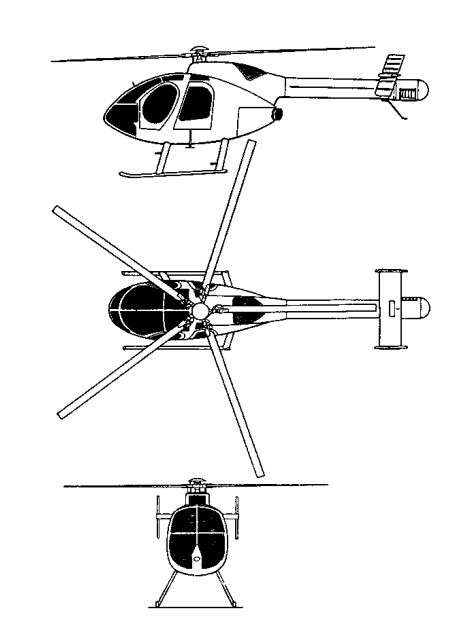 The first flight of an OH-6A NOTAR concept-demonstrator was made on 17 December 1981. The commitment to full-scale development and production was made in 1987. An extensive modifications during 1985 with second blowing slot, new fan, 250-C20B engine and MD 500E nose, led to flight testing resuming on 12 March 1986 and completed in June. The demonstrator was retired to US Army Aviation Museum, Fort Rucker, Alabama, October 1990. Commercial MD 520N and uprated (485 kW Rolls Royce 250-C30) MD 530N NOTAR helicopters announced February 1988 and officially launched January 1989. The first production prototype MD 530N (N530NT) flew on 29 December 1989, but this variant not pursued. First flight 520N (N520NT) on 1 May 1990 and first production 520N 28 June 1991. 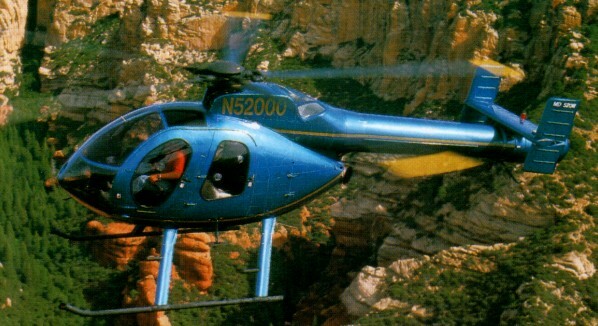 The 520N was certified on 12 September 1991 on the MD500 type certificate and the first production aircraft 520N (N521FB) delivered to Phoenix Police Department 31 October 1991. MD 520N set new Paris to London speed record in September 1992, at 1 hour 22 minutes 29 seconds. The structure is the same as the MD 500E/530F, except graphite composites tailboom; metal tailplane and fins; new high-efficiency fan with composites blades fitted in production aircraft. NOTAR system components now have twice the lifespan of conventional tail rotor system assemblies. During 1993, NOTAR system components' warranty increased from two to three years. Thicker fuselage skins, to reduce surface rippling, was to be introduced during 2001. The single Rolls-Royce 250-C20R turboshaft, derated to 317kW for T-O (5 minutes) and 280kW maximum continuous. Improved, heavy-duty transmission, rating 447kW, derated to 317kW for T-O, 280kW maximum continuous, on production aircraft from June 1995. Fuel capacity 235 litres. Customers had a total of 99 registered by mid-2002. Four delivered in 2000, two in 2001 and four in 2002. Law enforcement agencies flying MD 520Ns include Phoenix, Arizona (first operator; two more delivered in early 2002); Burbank, Glendale, Huntington Beach, Los Angeles, Ontario and San Jose, California; Hernando County, Florida; Orange County, Florida; Jefferson County, Kentucky, which took delivery of one in March 2002; Prince George County, Clinton, Maryland, which took delivery of two on 4 October 2000; Hamilton County, Ohio, which has seven 520Ns; El Salvador, whose Policia Nacional Civil took delivery of two in 1996; San Juan, Puerto Rico; Honolulu, Hawaii; and Calgary, Alberta, Canada. Other operators include the Tata Group of Mumbai, India, Weetabix Ltd, UK, and Belgian Gendarmerie (two). The unit cost was US$980,000 (2002). Héli-Max Ltée from Trois-rivières, Québec, Canada was the first canadian operator of MD520N model. They bought 6 of them.